Some music writers call it Latintronica, the mixture of Latin-oriented music with DJ culture and hip hop flavored recording styles and techniques. In the past we’ve featured bands such as Da Cruz, The Spam Allstars and Side Stepper, all of whom fall squarely into this category. Today, we feature Novalima but with another twist—Novalima’s new recording has a remix twin album and so we are offering both originals and remixes of Novalima’s music. Novalima is now a band built on a foundation of Afro-Peruvivan rhythms and approaches to music making. They use both traditional instruments and computers, but they emphasize Peruvian percussion instruments. Novalima started off as a collective made up of four high school friends who at the time were living in four different cities: Ramón Pérez Prieto in Lima, Rafael Morales in London, Carlos Li Carrillo in Hong Kong, and Grimaldo del Solar in Barcelona. They used the internet to exchange music and develop their ideas. They formed the collective in 2001, and in 2002 released a self-titled debut that earned them a recording contract. 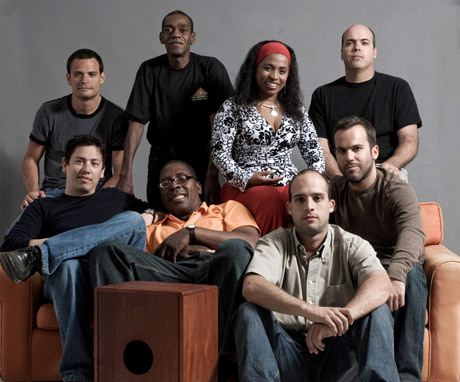 For their second release, Afro, and their current release, Coba Coba, the 4-member collective expanded into a nine member ensemble with the addition of noted Afro-Peruvian percussionists and vocalists Juan Medrano Cotito, Mangüe Vasquez, Milagros Guerrero, Marcos Mosquera, and Constantino Alvarez. Novalima’s sound is a collage from widely diverse sources—what strikes me most is how much reggae and dub have influenced them not just in terms of sound but also in terms of how they approach mixing their music. Or should I be more accurate and say, that, this is what strikes me about the remixes—and after all the remixes are the focus of this quick listen. Of course, I also dig the distinctive Peruvian percussion. Similar to the United States, the colonial authorities, both state and church, forbade the enslaved Africans to own their own instruments, and specifically forbade drums. So we did what we do throughout the Diaspora when faced with prohibitions? We improvised a response and used whatever was available to fulfil our creative objectives. This specifically led to the development of instruments that today are uniquely identified with Peru. The “cajon” (“box”) is a wooden drum constructed from wooden crates that were initially used to carry the harvest during the period of slavery. In an ironic turn, the cajita was turned into a percussion instrument. The cajita was “adapted” form the wooden boxes that Catholic priests used for Sunday collections. The sounds are generated by opening and slamming the top and by tapping the sides. The quijada de burro is the jaw bone of a donkey. The teeth of the donkey rattle when struck and can also be used as a scraper. This was shot in El Carmen, a village about two hours south of Lima that is a strong hold of the small Afro-Peruvian population. In the video, youth are shown playing stick games, creatively constructing an activity that combines stick ball (without a “ball”) and dance—it’s a sight to behold! It is estimated that Afro-Peruvians account for less than ten percent of the total population, but much like their brothers and sisters in the good old USA, who comprise only approximately 12% of the population, Afro-Peruvian musical development is becoming the most significant contribution of Peru to world culture. Novalima is at the forefront of this movement not just in terms of their sound but also in terms of the mixing of different elements in the make up the musicians—a mixing that directly contradictions Peru’s traditionally rigid segregation. While the music may simply sound like the latest example of club music at first listen, there is much, much more going on. A big question is will they be able to develop and will they be more than simply a momentary fad? Moreover, on a practical level, there is the major question that must be faced by all music that is generated with computers: how well does the music work live? Can a band recreate in performance the sounds that were achieved in the studio? Is the human energy of the group enhanced or muted by the use of electronics? Of course, there is much, much more to Novalima than is presented in this brief outline. For example, there is a heavy delving into the Afro-Peruvian musical traditions, both for source material and for inspiration. But for now, just follow your ears. If you dig it, go deeper, if not, then at least you have heard from another corner of a global Diaspora of music that is either directly based on or hugely influenced by the music and social experiences of people of African descent across the globe.